“I now realize all the dreams of my youth,” wrote Goethe on his arrival in Rome in the winter of 1786. Perhaps Rome today is more chaotic, but it is certainly no less romantic or fascinating. In this city, a phenomenal concentration of history, legend and monuments coexists with an equally phenomenal concentration of people busily going about everyday life. Modern-day Rome is a city of about four million residents and, as the capital of Italy, it is the centre of national government. Tourists usually spend their time in the historic centre, thereby avoiding the sprawling and architecturally anonymous suburbs. While the look of central Rome is most obviously defined by the baroque style of the many fountains, churches and palaces, there are also ancient monuments, and beautiful churches and buildings of the medieval Gothic and Renaissance periods, along with the architectural embellishments of the post-Risorgimento and Fascist eras. Realistically, a week is probably a reasonable amount of time to explore the city. Whatever time you devote to Rome, put on your walking shoes, buy a good map and plan your time carefully and the city will seem less overwhelming than it first appears. If you are planning to visit Rome in July or August, remember that that the hot and humid weather can make sightseeing an unpleasant pastime. The upside is that most Romans head for the beaches or mountains at this time, leaving the city quieter and more tolerable. In Rome, there is visible evidence of the two great empires of the western world: the Roman Empire and the Christian Church. From the Foro Romano and the Colosseo to the Basilica San Pietro and Il Vaticano and in almost every piazza, lies history on so many levels that the saying “Rome, a life-time is not enough” must certainly be true. It is generally agreed that Rome had its origins in a group of Etruscan, Latin and Sabine settlements on the Palatino, Esquilino and Quirinale hills. These and surrounding hills constitute the now-famous seven hills of the city. Ancient Romans put the date of their city’s foundation as 21 April 753 BC and, indeed, archaeological discoveries have confirmed the existence of a settlement on the Palatino in that period. However, it is the legend of Romulus and Remus, which prevails. According to this legend, the twin sons of Rhea Silvia and the war god Mars were raised by a she-wolf after being abandoned on the banks of the Tiber river. The myth says Romulus killed his brother during a battle over who should govern and then established the city of Rome on the Palatino, with himself as the first king. Later, he disappeared one day, enveloped in a cloud that was believed to have carried him back to the domain of the gods. Out of the legend grew an empire which eventually controlled almost the entire world known to Europeans at the time, an achievement described by a historian of the day as “without parallel in human history”. Rome has always inspired wonder and awe in its visitors. Its ruined, but still quite imposing, monuments represent a point of reference for a city which, through the imperial, medieval, Renaissance and baroque periods and beyond, has undergone many transformations. The cultured and wealthy Europeans who, from the mid-17th century onwards, rediscovered Rome, found in the Eternal City a continuity from the pagan to the Christian worlds. In fact, from the time of the Roman Empire, through the development of Christianity to the present day – a period of more than 2500 years – Rome has built up an archaeological archive of Western culture. The historical sites of Rome are merely the tip of the iceberg. Tourists wandering around the city with their eyes raised to admire its monuments should know that about 4m under their feet exists another city, with traces of other settlements deeper still. The Basilica di San Pietro stands on the site of an earlier basilica built by Emperor Constantine in the 4th century over the necropolis where San Pietro was buried. 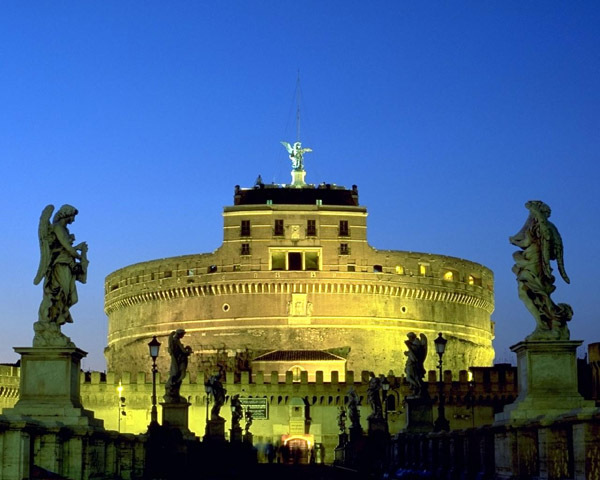 Castel Sant’Angelo was the tomb of Emperor Hadrian before it was converted into a fortress. The form of Piazza Navona is suggestive of a hippodrome and, in fact, it was built on the ruins of Emperor Domitian’s stadium. To know all this can help you interpret and understand this chaotic and often frustrating city. Rome is a vast city, but the historic centre is relatively small, defined by the twisting Tiber river to the west, the sprawling Villa Borghese park to the north, the Roman Forum and Palatine Hill to the south and the central train station, Stazione Termini, to the east. Most of the major sights are within a reasonable distance of the station. It is, for instance, possible to walk from the Colosseo, through the Roman Forum and the Palatine, up to Piazza di Spagna and across to the Vatican in one day, although such a full itinerary is hardly recommended, even for the most dedicated tourist. One of the great pleasures of being in Rome is wandering through the many beautiful piazza, stopping now and again for a caffé ot a gelato. Most new arrivals in Rome will end up at the main station Termini, which is the terminal for all international and national trains. The station is commonly referred to as Termini. The main city bus station is on Piaza dei Cinquecento, directly in front of the station. Many intercity buses depart from and arrive at the front of Stazione Tiburtina, accessible from Termini on the Metropolitana Linea B. This should not be confused with Piazzale Tiburtino, at the top of Via Tiburtina near Stazione Termini. Buses serving towns in the region of Lazio depart from various points throughout the city, usually corresponding to stops on Metro lines. The main airport is Leonardo da Vinci (also known as Fiumicino Airport) at Fiumicino. From the city centre, ti is about half an hour by the special airport-Termini train or 45 minutes to one hour by car. A second airport, Ciampino, south of the city on the Via Appia Nuova, handles most charter flights to Rome. It is not as easily accessible as Fiumicino. If you plan to arrive in Rome by car, invest in a good road map of the city before-hand, so as to have an idea of the various routes into the city centre. Rome is encircled by a ring road, called the Grande Raccordo Anulare, which is connected to the A1 autostrada, the main north-south route in Italy. The main access routes from the GRA into the city centre include Via Salaria from the north, Via Aurelia from the north-west and Via Cristoforo Colombo from the south.